The 4 year education program is intended to students of 2.5 years old (Nursery I - TPS); 3 years old (Nursery II - PS); 4 years old (Kindergarten I - MS) and 5 years old (Kindergarten II - GS). 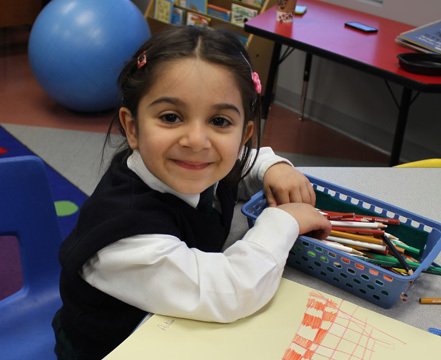 The TPS and PS (2:30 and 3 years old) is admitted to the Providence Educational Center Antonine Sisters (Pavillon Annex to the Providence Academy). The enrollement is based on a first-come first-serve basis. Stimulating activities that promote moral and religious awe to God, the author of creation; expressing religious feelings; learning to act with others in friendship and hospitality; distinguishing what is acceptable and what is not acceptable. Understand an instruction given by an adult; be able to answer questions; understand a story; discuss collectively; comment on an event. Graphic activities: properly hold a pencil, brush or marker; draw on all the space of a sheet; begin to control his actions. Count up to 5 and differentiate between numbers up to 3; count and compare very small collections; rebuild a fragmented image (puzzle, tiles ...); differentiate overall figures and shapes by sight and touch; reproduce the circle and recognize the shapes: triangle and rectangle; compare, classify and arrange items according to shape or size; organize and assemble stackable and construction sets. Locate oneself in time, distinguish days of the week; have a first notion of past time (day, week, month, year ...); locate in space using a spatial vocabulary (in front, behind, above, below); discover living organisms, parts of the body, the five senses; apply hygiene rules (body, health, nutrition, locations); discover the environment, objects and matter. Act and express with the body: running, jumping, throwing to break a record, moving with unstable elements (bicycles, tricycles, scooters ...); participate in team games: throwing, running, catching, avoiding ...; dance to a rhythm. Develop perception, sensitivity, imagination, creation: explore different artistic forms (drawing, painting, collage, making object); develop listening and voice; learn and recite rhymes, poems and songs; develop its capacity to organize space. Learn the rules of civility and principles of behavior in accordance with morality; learn to communicate, share activities; learn to cooperate, assist, engage, build relationships with peers and adults; learn to become autonomous; understand school life and living together. Talk and build a French vocabulary; share; express oneself; understand a friend who speaks; understand instructions; progress in oral proficiency; acquire vocabulary; become familiar with the writing; prepare to learn to read and write. Count up to 30, differentiate the numbers up to 10 and recognize the order of the numbers; express quantities and numbers; discover shapes and sizes; use terms that express measurement; identify a simple shape: circle, square, rectangle, triangle, diamond and reproduce a circle; organize patterns according to shape criteria; make a collection according to a pattern. Locate oneself in time, realize that time passes: yesterday, today, tomorrow ... locate in space using a spatial vocabulary; discover the living world: breeding, planting, parts of the body, the five senses; learn the rules of hygiene of life: health, nutrition, respect of life; discover objects, understand their use. Discover matter, identify its characteristics. Explore the possibilities of the body in various situations; develop coping skills and cooperation; develop body expression: body language, rhythm; learn to explore a given space, to move in a specific space; acquire oriented body image. Develop perception, sensitivity, imagination, and ability to create through visual activities; practice drawing, painting, and modeling; develop listening through vocal activities, rhythmic; develop capabilities to organize space by rhythmic dances, theater, acting, and role playing. Learn the rules of civility and principles of behavior in accordance with morality; learn to communicate, share activities, cooperate, assist, engage, build relationships with peers and adults; learn to become independent; understand school life and living together. Develop language and oral communication; learn the basics of the language of origin: 28 alphabetic letters gradually spread over 24 modules, depending on their phonetic: 25 consonants supported by three vowels a - o - i and the four main accents; prepare to read and write.